Former Vice-President German Vargas is a veteran politician who was born into one of Colombia’s political dynasties and has long been close to or in power. 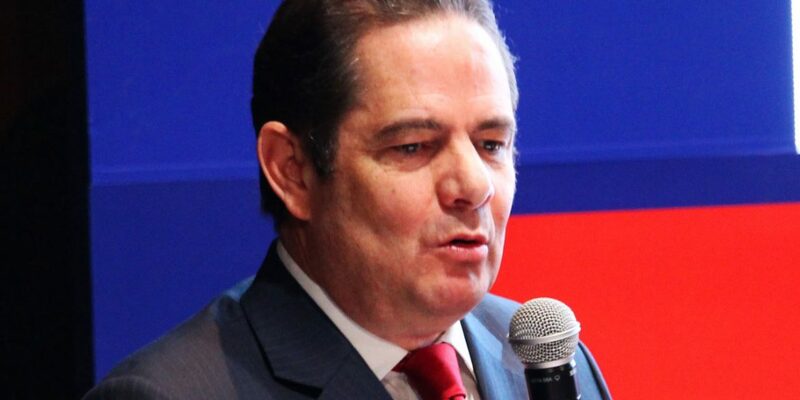 Vargas was born in Bogota on February 19, 1962 as the grandson of former Colombian President Carlos Lleras Restrepo (1964-1970) and the nephew of former presidential candidate and journalist Carlos Lleras de la Fuente. After receiving a undergraduate degree in Law at Bogota’s elite Universidad del Rosario, Vargas went to Spain where he got his Ph.D in Government and Political Science. At 19 Vargas joined the anti-corruption New Liberalism movement of then-Senator Luis Carlos Galan. The young politician was elected council member of the Bojaca municipality in the central Colombian Cundinamarca department and later named political coordinator of the Galan campaign in one of Bogota’s districts. Following the murder of Galan in 1989, Vargas left the crumbling New Liberalism movement to join the traditional Liberal Party and in 1992 was elected council member for that party in the capital’s Los Martires district where he previously campaigned for Galan. In 1994, Vargas was elected Senator for the first time, a position he held for four consecutive periods in which he changed party two times. Following his split with the Liberal Party in 2001 over increasing discontent with the then-ongoing peace talks with guerrilla group FARC, Vargas created the Colombia Siempre movement under whose flag he was elected into Congress in March 2002. As senator, Vargas supported another former Liberal Party member, Alvaro Uribe, in his successful bid for the 2002-2006 presidency. Months after this election, Vargas was victim of a first attempted assassination allegedly carried out by the Marxist ELN rebel group. In 2003, Colombia Siempre joined the Radical Change party of which Vargas was elected president within a year. Fellow-former Liberal Party veteran and reformed “Uribista” Juan Manuel Santos invited Radical Change to join his newly formed U Party in 2005. Vargas rejected the offer. In October of that year, Vargas survived a second assassination attempt. While initially blaming the FARC for the attack, documents leaked by the DAS in 2011 showed that the now-dismantled intelligence agency was suspecting its own people of having facilitated the attack. Despite surging allegations of ties between paramilitary group AUC and coalition politicians, Radical Change supported Uribe’s successful 2006 election bid and, together with the U and the Conservative Party, became key members of Uribe’s congressional coalition. However, the further unraveling of the so-called “parapolitics” scandal hit Vargas’ party hard. Five of eight Radical Change senators and three of 11 representatives were suspended while prosecutors investigated their alleged ties to paramilitary groups. “Parapolitics” investigator and former Senator Claudia Lopez on multiple occasions accused Vargas of having used his ties to warlord “Martin Llanos” to be elected, but these claims were never proven. In 2008, the Radical Change leader resigned from the Senate “to study” and announced his opposition to a second reelection of Uribe, which was being led by Santos’ U Party. Instead, Vargas announced to be running for president himself in 2009 creating increasing tensions between the then-president and his former ally. Vargas’ revoked support for Uribe allowed Santos to present himself as the ideological heir of Uribe and the person who would continue the government’s increasingly controversial, but popular “Democratic Security” policy. The opposition to Uribe’s reelection proved an electoral misstep for Vargas. Several of his Radical Change’s lawmakers left the party and the party lost 40% in electoral support during the 2010 congressional elections. Vargas’ bid for the 2010 presidency failed in the first round as he received only 10% of the votes. But even before the newly-elected Santos took power in August that year, Vargas was appointed as the incoming Interior and Justice Minister. After that ministry was split in two, the Radical Change leader became Housing Minister and politically responsible for an ambitious housing project that aims to provide 100 thousand free homes to poor Colombians within two years. The ongoing allegations of paramilitary ties did not stop Santos from appointing Vargas as his vice president. Both elite politicians had jointly campaigned for the 2014-2018 presidency and successfully opposed the candidacy of Oscar Ivan Zuluaga who had been pushed forward by Vargas’ rival, Uribe. As vice president and with clear ambitions to run for president in 2018, Vargas assumed more responsibilities in the cabinet and became the leading figure in the Santos administration to oversee major infrastructure projects deemed crucial for Colombia’s (rural) development and international competitiveness. He stepped down in March 2017, just in time to prepare the revamped presidential ambitions announced on August 28. While initially tipped as one one the favorites to become Colombia’s next president, Vargas’ campaign was soon accused of widespread election fraud and failed to take off. His party, nevertheless, performed better than ever in the March 2018 election, presumably because of the fraud that was never investigated. Radical Change became the second largest party in Congress, going from eight to 15 seats in the senate and from 15 to 30 seats in the House of representatives. The move forced Duque and his hard-right Democratic Center party to negotiate support with Vargas, making him one of the most powerful politicians in Colombia’s politics without fulfilling an official role.